Summer's Here and the Time is Right...for Summer Gigs! Ladies and gentlemen, welcome to June. While summer might not technically start until June 20th, I've always gone by the theory that summer kicks off with Memorial Day weekend. That's certainly when people start acting like its' summer. 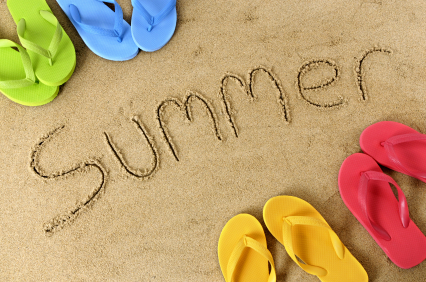 Shorts, flip-flops, barbecues, iced coffee - these are a few of my favorite things and they all mean that summer, and the summer gig season, is here. GigMasters Guide to Outdoor Gigs - Tips from a wide variety of GigMasters entertainers on what to bring to an outdoor gig, how to stay out of the sun and why an extra shirt is always a good idea. Keep Your Cool During Hot Gigs - Another round of tips to keep you from overheating at those summer gigs. These come straight from the leader of a steel drum band, someone who knows a little something about what to do when gigs get hot hot hot! Apps for Finding Cheap Gas on the Road - Unless you travel by train, gassing up the ride is one of the biggest expenses for just about any gigging entertainer. Everyone wants to know where the cheapest gas is along their route, check out the apps that can help save you cash. 2012 Summer Music Festival Calendar - Sure, it might be a little late to get your band accepted to play at any major music festivals...but you never know! Let us know your own advice for beating the heat and have an amazing summer! !